The Nell Hodgson Woodruff School of Nursing celebrates the life of one of its most beloved faculty members. Professor Emeritus Dr. Elizabeth Mabry died Wednesday, June 6, 2018, at the age of 96. 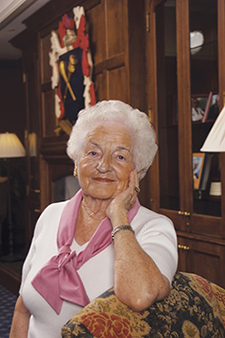 As a member of the faculty from 1948 to 1998 and Educational Director at Emory Crawford Long, Dr. Mabry made a lasting impact on generations of School of Nursing faculty and students. A compassionate caregiver with a breadth and depth of nursing experience, Dr. Mabry emphasized the mind-body-spirit-emotion-environment approach to the practice of traditional nursing, later coined “whole nursing.” Teaching everything from basic sciences to medical/surgical and psychiatric nursing, Mabry underscored the importance of the nurse-patient relationship and the essential roles that nurses play in the coordination of care and the interdisciplinary education of all healthcare providers. Dr. Mabry was a pioneer in her thinking and approach to teaching. Her legacy will live on through our faculty, students, alumni and the values of leadership, excellence, and patient-centered care that she has instilled throughout our community. A memorial service will be held at 2 P.M. on Sunday, June 17 at Druid Hills Presbyterian Church, 1026 Ponce de Leon Avenue, NE, Atlanta, Georgia 30306. Memorial gifts may be made to the Elizabeth Mabry Scholarship Fund at Emory's Nell Hodgson Woodruff School of Nursing. You can give online or send checks made out to Emory University to Office of Gift Records Emory University; 1762 Clifton Road, Ste 1400MS: 0970-001-8AA; Atlanta, GA 30322-400; Re: Elizabeth Mabry Scholarship Fund. You may also share your personal condolences and messages to Dr. Elizabeth Mabry's family through this brief online form. All messages will be delivered to Dr. Mabry's family on your behalf. Questions can be directed to Amy Dorrill, Associate Dean of Development and Alumni Relations at the School of Nursing at 404-727-6264.